Movement space is the space occupied by man by means of movement; it constantly becomes more expanded and complex as the body moves. By consequence, man’s activity of designing and occupying space begins with the body. Crystal Bodies is a workshop based on mapping and materializing the body’s actions that are made up of various movements and ephemeral by nature. The workshop is based on the premise that no body is without its disabilities, that every body comprises of a series of traits and singularities of its own; therefore, it emphasizes every body’s capacity to generate difference and establish a norm for itself – rather than centralizing a categorical state of being disabled. 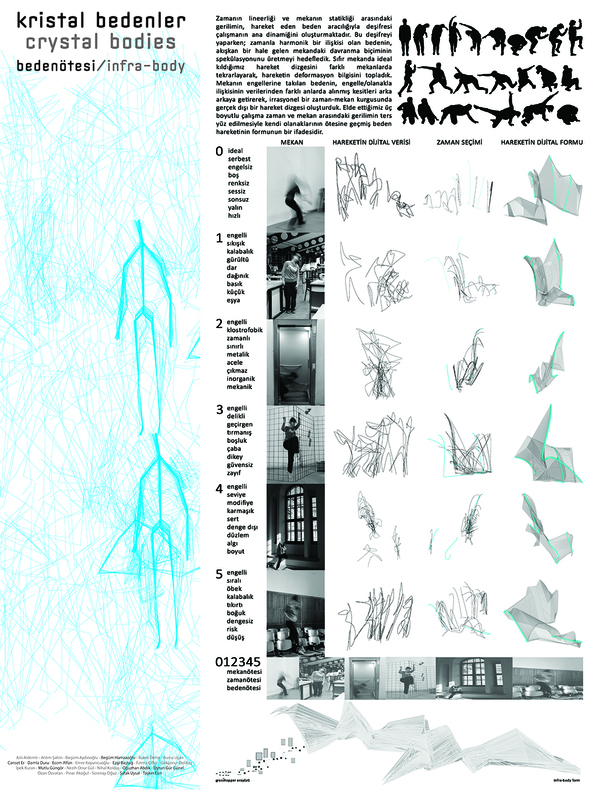 The process is inspired by Edward Muybridge‘s photographic series, Etienne-Jules Marey‘s movement analyses, Henri Bergson‘s conceptualization of time as duration, Futurism‘s search for a way of visualizing dynamics of sensation, Loie Fuller‘s fabric dances, Oskar Schlemmer‘s spatial/theatrical research, Laban‘s Movement Analysis and William Forsythe‘s improvisation technologies, among many others. Before everything else, we are interested in widening our perceptual field to include and make visible the body’s capacity to generate/shape space. In this respect, “crystal” refers to the structure of those architectural/sculptural forms to be generated during the workshop as well as the fragility of the bodies/movements lying at the source of these forms. 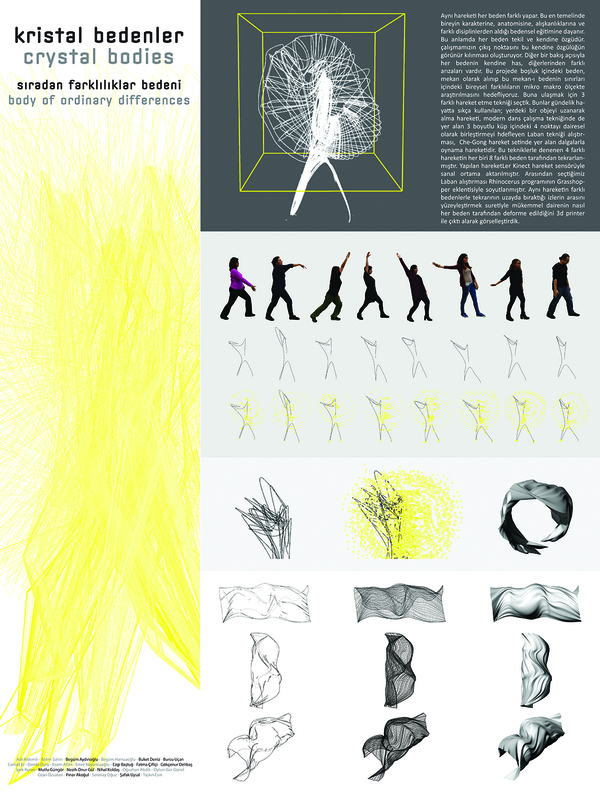 At the beginning of this three-day workshop, we’ll make a basic introduction to simple motion-capture technologies by means of three-dimensional modelling software such as Rhinoceros and Grasshopper, and then follow a three-stage methodology whereby we capture, visually express and manipulate the information captured from the body’s movements so as to generate a three-dimensional form. 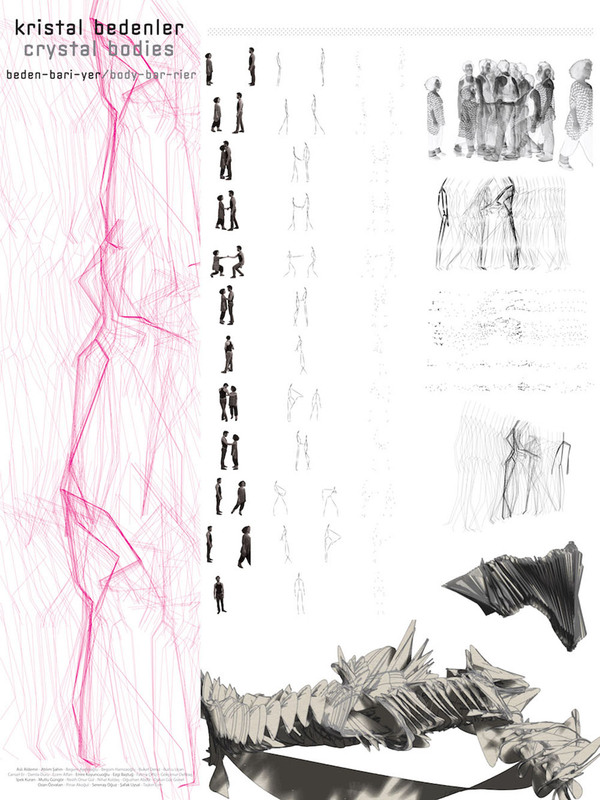 At the end, each group will produce a poster summarizing their process as well as a 3D print of their final form. The workshop is open to everyone enthusiastic about the idea of looking at “disability” from several perspectives, articulating its diverse dimensions. Participants will work in groups of 5-6 people with different backgrounds. New graduates, graduate students and young professionals from various fields of design and art such as architecture, interior architecture, industrial design, graphic design, animation, new media, cinema, dance and theatre as well as researchers that focus on the body within the contexts of sociology, philosophy, cultural studies, dramaturgy and the like are especially invited. One person from the fields of sociology, philosophy, cultural studies, and the like. Profile-wise, our target audience includes new graduates, graduate students and young professionals; yet, others are welcome to apply. Those who are willing to participate can submit a short letter of intention and a resume to bodyspace@amberplatform.org. Designers are expected, in addition, to present a (preferably web-based) portfolio, including samples from previous works.